Imagine an existence where memories can be traded in order to experience the memories of others. This is the reality of Kaiba but unfortunately for our protagonist, he has no memories and is suffering from a form of amnesia. The only memory that he has which may or may not be his, is the picture of a girl that is contained in his pendant. His goal is to find this mysterious girl as he travels through this universe of memories in order to find his love. This science fiction anime romance is the tale of Kaiba, a creature who is not only trying to find his purpose in this universe but also this mysterious girl that plagues his existence. As we follow his story, he will encounter many different beings in his search and as the series progresses, the viewer is given little insights into their relationship that is actually rather cute. Unfortunately in this realm where precious memories can be traded, money is the precursor to all evil and in order to trade or "buy" memories, money is required and those with the most money have the most power. This adds to a catalyst to the story, especially with some of the action sequences. Another twist to this series is that these human-like creatures can also swap bodies with each other that creates a very surreal extesentialist experience and everything is definitely not black and white in this series, especially with its "colourful" and strange animation. Did I mention that Kaiba is also not in his own body! Kaiba's only ace up his sleeve is that he can enter other peoples memories and his journey to find his love will get him involved with all elements of people in this series from those in power to those with none. For me, Kaiba is like vigilante with amnesia but even though he does not remember, his morals are still intact. It's a fascinating series. The animation in Kaiba is definitely not mainstream and is quite out there from its strange colourful characters to psychedelic effects. The creators however have used some great animation techniques or special effects to enhance the story such as the characters going into each others memories or bodies that really stand out. For me, Kaiba is like a children's series on some form of illegal drug but it actually suits the premise well. Video quality is good, although the colours do look a little washed out at times. Sound on the other hand supports Dolby Digital 2.0 for the Japanese track with English subtitles. Music is done by Kiyoshi Yoshida (The Girl Who Leapt Through Time) and his tunes add a very magical like soothing soundtrack to this sometimes complex story. Give these facts, Kaiba is not really a children's series and there's quite a bit of mature content thrown into the mix such as the epic battles laced through the series, adult themes and even sexual references. 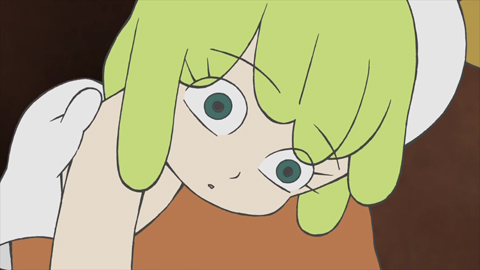 Director Masaaki Yuasa (The Tatami Galaxy) has done a marvellous job at creating a very engaging and non-mainstream anime creation.